Newnansville was originally settled by the Dell brothers and called Dell's Post Office about 1818. 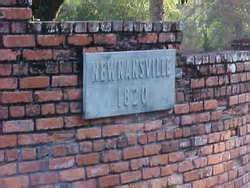 The town became the county seat and renamed Newnansville, 1824. They constructed a post office on the Bellamy Avenue in 1826, called Dell's, which became the nucleus of the new settlemen. There was a Methodist Church, school, hotel, courthouse, and Fort Gilleland. 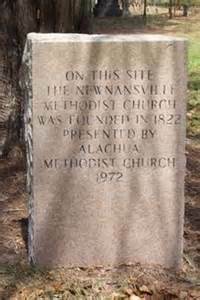 At one time the nearly the entire voting population of Alachua County, which was much larger then, could be found in Newnansville. When the railroad came through from Fernandina to Cedar Key it stopped in a small area called "Hog Town". This would later become Gainesville, home of the University of Florida. The courthouse was moved to Gainesville. Eventually a RR spur would come near but not near enough and create the town of Alachua. The remaining businesses moved near the RR and shortly Newnansville would be a ghost town, 1890. There were some homes remaining from the original town but are gone now. 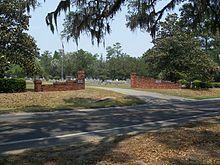 The cemetery still bears the name of Newnansville and the graves carry the names of those early residents who lived and died there. There is also a Black Cemetery in the rear. A Historical Marker marks the original spot of the town. After Florida was ceded to the United States by Spain, the need for an improved road connecting the two early cities quickly became apparent. Congress appropriated money for the project and placed the work under the supervision of the U.S. Army.Captain Daniel Burch, the officer assigned to direct the project, decided to contract out the section east of the Apalachicola River, while the army itself built the stretch west of the river.On December 18, 1824, John Bellamy entered a bid to build the section of the new road between the St. John's River near St. Augusting and the Ochlockonee River near the new territorial capital of Tallahassee. He could complete the project, he believed, for $13,500.The bid was accepted and in early 1825 work began on laying out, clearing and building the road Construction moved forward quickly and by June Captain Burch was able to report that Bellamy (who also spelled his name "Bellame") had made significant progress: Before the construction of the road, Indian trails were used for travel, but those were often narrow and overgrown with nature since they were meant for pedestrians, not horses and wagons. Congress required that the road be 25 feet wide — wide enough for two wagons to pass each other — and have a strip of grass in the middle for horses and oxen to graze.